Here’s what happened in last night’s game. Each PC gets 1,600 xp. 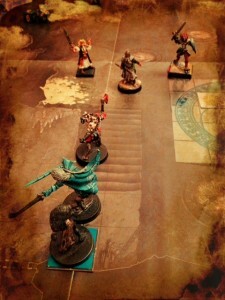 Juma is keen to push on to Skalmad’s throne room so the PCs approach the double doors leading to the foundry. Hrothgar listens at the doors and can hear metal being hammered and voices talking in Giant which gives the Juma Gang pause. Instead of going straight ahead, they decide to wade up the underground stream to see if they can work their way round to attack Skalmad by surprise from the rear – an approach Juma naturally favours. Gil creates a Tenser’s Floating Disc to carry his scrolls, spell books and him above the water and Ulthar uses his cloak of shadowform to fly; the others get wet. They arrive in the dragon’s cavern but there is no sign of the beast so they continue east along the stream. Spotting stone steps leading out of the water to a lit area above, Hrothgar tries to sneak up the stairs but isn’t quiet enough. 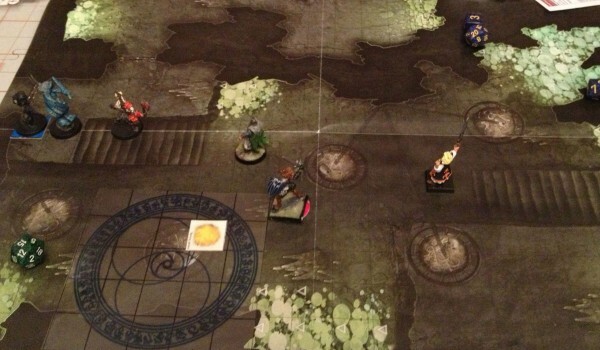 A nothic gazer and a boulder-shaped galeb duhr attack the gnoll first, as three trolls and another nothic join the battle shortly afterwards. Sora bravely charges two of the trolls but soon goes unconscious despite Gil’s phantasmal killer working better than it has ever done before to strike fear into one of the warty green giants. 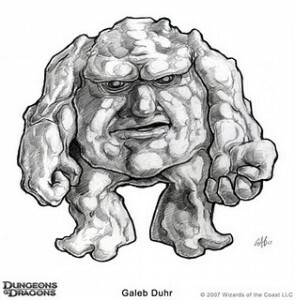 Meanwhile the other three PCs have got rid of one nothic and are battling the third troll and the galeb duhr which is turning as much of the cavern floor into uneven rocky ground as it can. Ulthar breaks off to heal Sora as the galeb duhr shoves Hrothgar into a pool of pitch. The earth creature is badly wounded and tries to surrender but the barbarian can’t understand a word it’s saying and splits it in two with its axe. The PCs finish off the trolls using Gil’s fire magic to stop them regenerating and then slay the last nothic. From this cavern, Hrothgar scouts ahead, crossing a log bridge over the stream and coming into a large cavern divided into makeshift rooms by crude stone walls. He signals the others to join him and they search around, finding evidence that drow from the same clan they ran into in the Trollhaunt are also living here. Heading southwest, the PCs come into a spacious chamber illuminated by glowing green fungi. Five large iron cages hang from the ceiling, each containing a troll skeleton, and an old woman can be seen pottering about among the mushrooms. Hrothgar is pretty sure the sweet old lady is a hag so Sora casts wrath of the gods and the PCs attack. The briar hag, Geala, is quickest off the mark, though, and traps the Juma Gang in a thorny briar patch which Hrothgar in particular struggles to get out of. Of course, the skeletons in the cages animate and leap down to attack too! Ulthar is in a weird situation for most of this battle as several of the party are down to their last surge and don’t want to be healed. He doesn’t get long to ponder this – a second hag, Morsha, appears and pulls a lever to drop an iron cage on his head, snapping him out of his thoughts. The skeletons shower anyone nearby with boneshards when bloodied or killed, and Sora who has flown down among them ends up very low on hit points with just one surge left. Eventually the skeletons are all destroyed and Geala is killed. Hrothgar pulls himself out of the briar patch and leaps onto a hanging cage to get to Morsha as quickly as possible. Juma joins him, having finally learned how to charge after 13 levels of adventuring. The PCs kill the odious crone and breathe a heavy sigh of relief. Leaving the two doors out of here closed for now, they head back to the stone houses to take a well-earned extended rest.